Eliminating deaths on our highways is a winnable battle. Just ask the thousands of transportation safety advocates who work tirelessly to achieve the goal of zero deaths on our highways. This week more than 450 medical professionals, law enforcement personnel, state and local officials, and more met in Cincinnati, Ohio, for the Governors Highway Safety Association’s (GHSA) annual meeting. The meeting included presentations and lively discussions on ways to reduce the nearly 34,000 deaths each year on our nation’s highways. Many focused on motorcycle safety, teen driving, occupant protection, aging drivers, and drunk driving. These are issues the NTSB has been focusing on for years, many of which are on the NTSB’s Most Wanted List. A common theme throughout the meeting was the need for all of us to change the way we approach driving. When behind the wheel, driving should be the focus. 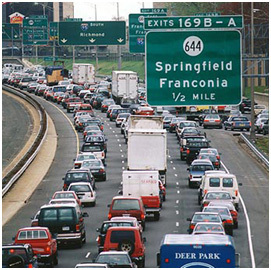 All of the distractions we have available today in our cars, buses, and trucks should not divert our attention. Driving can be enjoyable – not because of the many gadgets now available in vehicles – but because we are able to arrive at our intended destination safely without harming others. The NTSB welcomes the partnerships that it has forged with groups like GHSA. We have seen accidents firsthand and know full well the alarming rate in which highway deaths occur. We also understand the audacious task of working to dramatically improve the safety on our roadways. It is up to the highway community – and everyone who drives – to change the driving culture. And for parents, it is no longer as simple as teaching our children how to drive. They also need to fully understand the responsibility for themselves and others that goes with them when they climb behind the wheel. One strong message from the meeting is that getting to zero deaths on our nation’s roadways means creating a culture that embraces safe driving behavior as the norm. The NTSB couldn’t agree more and is working to achieve that goal. Don Karol is Director of the Office of Highway Safety. Everyone has gotten up from a night’s rest feeling more tired than the night before. Often, it is from staying out too late, getting up early, or having something on your mind making it hard to sleep. Yet, for some, no matter how early they go to bed and how late they get up, they feel tired. One cause could be obstructive sleep apnea (OSA). Today, the five-member Board of the NTSB met to review the report of a marine accident that occurred in Port Arthur, Texas, on Jan. 23, 2010. 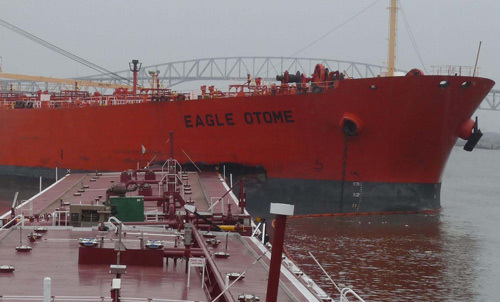 While transiting the Sabine-Naches Canal, the oil tankship Eagle Otome collided with a general cargo vessel and was subsequently hit by a barge being pushed by a towboat. This series of collisions resulted in a leak of an estimated 462,000 gallons of oil into the canal. One of the issues revealed in the investigation was the first pilot’s untreated OSA. Andrew J. Barbieri into a dock at St. George, Staten Island, New York, which killed 11 people and injured 70 more. The 2007 allision of the Cosco Busan with the Delta Tower of the San Francisco-Oakland Bay Bridge, San Francisco, California,releasing 53,000 gallons of fuel that contaminated 26 miles of shoreline and cost more than $70 million in environmental cleanup. The U.S. Coast Guard has been working to develop educational materials about sleep disorders and their diagnosis, but more needs to be done. At the helm of a several-hundred-thousand-ton oil tanker, cargo ship, or cruise ship is no place for a fatigued pilot. Do you know what union station means? It’s a train station where tracks and facilities are shared by two or more railway companies allowing for more convenient passenger connections. While New York City has Pennsylvania Station and Grand Central Station, here in Washington it’s Union Station. One-hundred and fifty-eight years ago today, on Sept. 20, 1853, the Indianapolis Union Railway opened the world’s first union station in the Wholesale District of Indianapolis. The idea was to address the growing number of competing railroads building their own stations within the city, which created problems for transferring both passengers and freight. I wonder if they knew then how integral rail transportation and these “union stations” would be to the growth of our nation and economy. Indianapolis continues to play an important role in our nation’s rail transportation system. 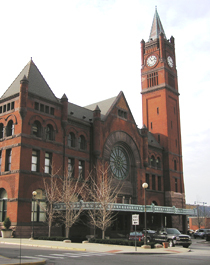 Today, Amtrak provides intercity rail passenger service at the historic Union Station. In addition, Indianapolis is also a hub for freight rail. The city is currently served by two Class I railroads – CSX and Norfolk Southern – and four short lines – Indiana Railroad Co., Indiana Southern, Louisville & Indiana Rail, and Central Railroad of Indiana. These freight railroads carry on the railroad tradition of helping drive our nation’s economic engine by safely and efficiently moving goods and materials to manufacturers and consumers. I was delighted to be at the luncheon earlier this year when Norfolk Southern and CSX were recognized for their outstanding safety performance at the 2010 E. H. Harriman Awards, the nation’s top railway safety recognition program. Norfolk Southern received the Gold Award for the 22nd year in a row and CSX received the Silver Award. Stephen Klejst is Director, Office of Railroad, Pipeline and Hazardous Materials Investigations. How many times have you been at an amusement park and seen one of those “you must be this tall to ride this ride” sign to determine whether your child can go on the ride? When it comes to fitting in an adult safety belt, there is a magic number for parents to remember: 4’9″. Chairman Hersman discussing proper use of child car seats with a parent. But until your child is 4’9″ tall, it can be a challenge to decide which car seat or booster seat is best and then determine whether you have installed it and are using it properly. Thanks to organizations like Safe Kids USA, it is easier for parents to do the right thing. In fact, this is National Child Passenger Safety Week and Safe Kids USA has organized hundreds of free car-seat inspection stations across the country. 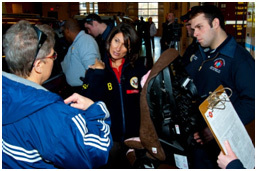 This year, the NTSB has made improving child and youth safety an agency priority. This week, you can take advantage of a free car-seat inspection station in your community to learn how to transport your child safely. To find an inspection station in your area, please go to: http://www.safekids.org/in-your-area/. Labor Day marks the end of the busy summer flying season. This summer, my wife and I had several great – and, happily, uneventful – flights in our Bonanza. However, sadly, many of our fellow general aviation (GA) pilots did not fare so well. The NTSB’s initial reports show that between Memorial Day and Labor Day, 158 pilots and passengers perished in 94 fatal GA accidents. While those numbers are slightly lower than the previous year, on an annual basis, the GA accident rate has been largely static for the last several years. As a community, we can do better. That’s why the NTSB placed improving GA safety on its Most Wanted List. Recently, Vice Chairman Chris Hart, also a GA pilot, and I visited the Aircraft Owners and Pilots Association (AOPA) Air Safety Institute (ASI). In an AOPA Live interview with ASI President Bruce Landsberg, we talked about how to improve GA safety. The Vice Chairman stressed education. I pointed out that improving safety does not necessarily require new regulations or new equipment. I emphasized that GA pilots largely determine their personal safety by the level of proficiency they maintain, the capability and condition of the aircraft they fly, and the manner in which they identify and manage their risks. Improving GA safety mostly means doing the things that we do as GA pilots, but doing them better, more safely, more thoughtfully, and with a better understanding of the situation and the risks. And, that leads directly to the Vice Chairman’s point: education. Pilots, please note that an excellent first stop for education is the AOPA website and ASI’s great online courses. Labor Day started over one hundred years ago as a national tribute to the contributions of workers. Today it has grown to a weekend filled with festivals, concerts and family gatherings. And while the long weekend is a reason for celebration, tragically, it is also one filled with far too many highway deaths – there were 360 deaths over Labor Day weekend in 2009. While the greater number of vehicles on the road creates additional risk, so too, does an increase in alcohol-impaired driving. The percentage of highway deaths involving drunk drivers is typically just under one-third, but that percentage climbs closer to 40 percent for Labor Day weekend. This weekend you’ll see more cops cracking down on impaired drivers as a part of the National Highway Traffic Safety Administration’s – Drive Sober or Get Pulled Over – nationwide campaign. Enjoy the Labor Day weekend by staying sober behind the wheel, that way, you and others on the road can live to work another day.